Former solider Craig Savage stole the semi-automatic rifle which he used to murder his estranged wife and her mother from a local gun range just minutes before the murders. Mr Savage booked the session at 1066 Target Sports 'live shooting range', in St Leonards, two days before the killings. He was met by instructor Ryan Graves, who later recalled Savage talking about 'police assisted suicide' and said he wanted 'to be remembered as a man'. Mr Savage then got in his car and embarked on a ten minute journey to Bexhill Road where he would commit double murder. A murder investigation has begun after the body of a man was found on the beach at St Leonards. Police believe the man is in his 60s. The family of a mother and daughter who died in a shooting in St Leonards, Sussex, have described them as "beautiful people". A man has been arrested on suspicion of murder after two women were shot dead at a house in St Leonards in Sussex on Friday night. Demonstrators have gathered in St Leonards to protest against the possible closure of the Crown Post Office. The Post Office revealed plans in July to replace or relocate directly-run Crown branches in 20 locations as part of a modernisation programme. But locals have described their post office as the 'beating heart' of the community. Sussex Police are appealing for witnesses after two women were arrested in connection with an incident in which several wing mirrors were damaged in the same road. It happened in Western Road in St Leonards in the early hours of Wednesday 21st December 2016. A 20-year-old woman from St Leonards, arrested on suspicion of criminal damage has been bailed until 18th January pending further enquiries. A 23-year-old woman, also from St Leonards, has been arrested on suspicion of criminal damage and using threatening or abusive words or behaviour likely to cause alarm or distress has also been bailed until 18th January pending further enquiries. It would be more at home in the Caribbean, but a huge seabird has been found washed up on the Sussex coast. It's the first time a Red-footed Booby has ever been seen in this country. The bird was on its last legs when an animal lover came to its rescue. Now, the Booby is being nursed back to health, ready to be flown thousands of miles home. Malcolm Shaw spoke to Richard Thompson of RSPCA Mallydams Wood, and Gail Cohen who found the bird. Detectives are investigating after a woman was raped as she walked home in St Leonards in the early hours of Sunday. 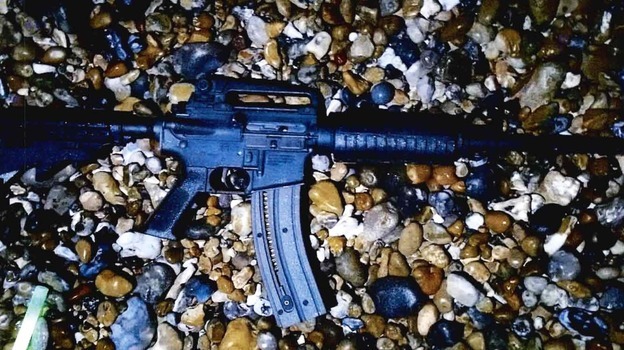 The 19-year old woman was walking along a pavement between London Road and St Margaret's Road, having been out in Hastings. She was grabbed from behind by a man who raped her, after which she ran off towards London Road, and the man did not appear to follow her. She made her way home and the crime was reported to the police later that day. "The suspect is described as about 5'9", with brown tanned skin, and had a beard. He was wearing a black hoody and a scarf. This was an horrific experience for the young woman, who is badly shocked. She is receiving support and expert counselling. "If you were out and about in St Leonards in the early hours of Sunday, and saw what happened, or saw either the woman or the suspect, near Warrior Square, we do need to hear from you. "Please contact us via 101@sussex.pnn.police.uk or call 101, quoting Operation Platinum. There is no recent record of attacks like this in the area, but we want to find this man before he tries to carry out anything similar."